Mike Fiechtner Photography || Seattle Wedding, Family and Senior Photographer — Hurry or you'll miss it!! Hurry or you'll miss it!! This last Sunday I woke up and went to church with my wonderful wife Mandy and unfortunately we had to part ways at the end of the service because she was going out to do some errands and go to a birthday party for a girl that she nannies. I on the other hand was going home but I had to catch a ride with our good friends, John and Nichelle. (If you need any wedding photography done John is your man!! Check out his site: Keatley Weddings. Sorry had to do a plug for him.) As we were driving back over the West Seattle bridge you could see a blanket of fog covering downtown Seattle. 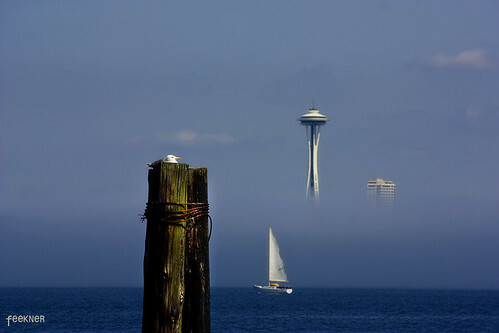 Only a little bit of the Space Needle was peaking through. My new photography focused brain kicked in and knew I had a great opportunity if I could get there. Before I could get out there we had to make a quick stop at the Keatley's house. They were in a rush to get to a ferry that they had to catch and so they dropped me off about 10 blocks from our house. John literally kicked me out and told me to get walkin'. We're not friends anymore. I had a whole bunch of stuff in my arms that they gave back to us from the camping trip that they forgot all of their clothes. (that's another story) I semi-ran and shuffled my way home as I knew the fog was going to burn off quickly. I finally got home threw the stuff down and grabbed my camera and jumped in the beast of a car, our 1989 Ford Tempo and started down the road towards Alki. What's this....a fuel warning light on. I decided to risk it hoping that I would make it. I did make it and the fog was still there but not for long. I had just enough time to capture this shot. Hope you enjoy!